A day after rumors ramped up that Phoenix Suns guard Goran Dragic would be on the move, he had some harsh words about the management in Phoenix. The reaction comes a day after reports came out that there was a damaged relationship between Dragic and the Suns front office. According to multiple media reports, Dragic’s representatives informed the team Tuesday that the guard will not sign an extension with Phoenix in the offseason. Along with that reveal came a list of teams to which Dragic would prefer to be traded to, which, according to the reports, include the Los Angeles Lakers, the New York Knicks and the Miami Heat. The NBA’s trade deadline is looming, set for Thursday at 1 p.m. MT. The Suns will have to move him before then if they don’t want to run the risk of him bolting in the offseason without compensation. This news comes after a tumultuous season in the Suns backcourt, featuring three guards who had been starting point guards in the past: Isaiah Thomas, Eric Bledsoe and Dragic himself. Along with the crowd of guards, Dragic has also expressed frustration about playing time as a shooting guard rather than as a point guard. Dragic has seen his stat totals dip after averaging 20.3 points and nearly six assists per game last season. His numbers so far on the year have been good, with averages of 16.2 points and 4.1 assists, but nowhere near the marks he was hitting a season ago. Coach Jeff Hornacek disregarded the notion that Dragic’s productivity took a hit because of the position change. The Suns as a team have also been struggling, as they’re currently on a 2-8 streak over their last 10 games. This is coming off of a year in which the team went 48-34 and missed the playoffs by one game. Phoenix currently sits in the eighth spot in the Western Conference standings. However, their lead over Oklahoma City has withered to a half-game with the recent struggles. 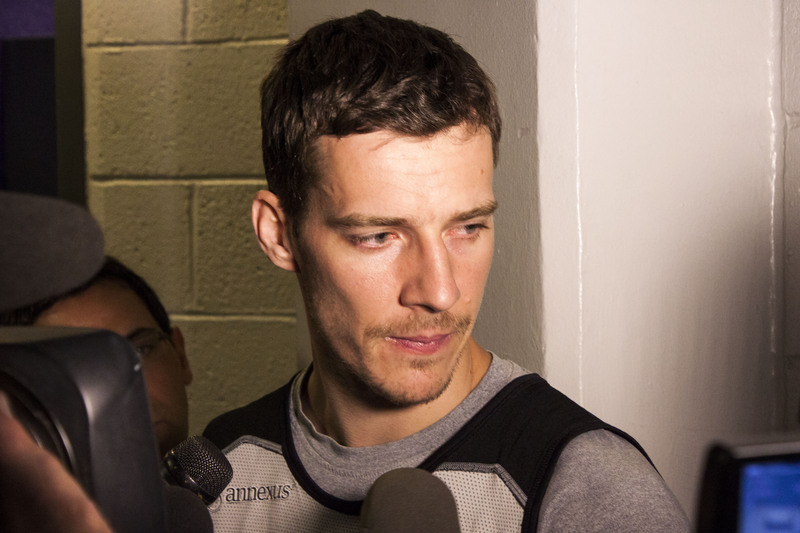 Phoenix Suns point gaurd Goran Dragic addresses trade rumors after practice Wednesday.